There are two types of Nong- small Nong and big Nong. They are used in different ceremonies. In general, Nong needs to be played/blown by only one person. Big Nong has to be exclusively played alone. Small Nong can either be played alone or with the other musical instruments such as Choengs and Gongs. Bunong people believe that “there are spirits residing in the Nong”. Thus they have to celebrate a ceremony for the Nong before they can use it. In this celebration ceremony they use the blood of one chicken and a jar of jar wine to sacrifice for the spirits. 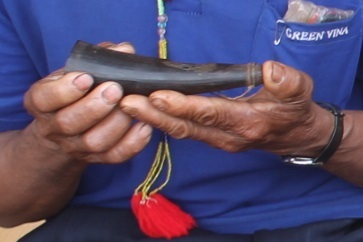 The small Nong is produced from the upper part of a buffalo’s horn. Its length is around 10 centimeters. It can be played/blown anywhere and at anytime. It can be played in the rice ceremony and when they win the war. In the rice ceremony, Bunong people kill cows, buffalos, pigs and drink jar wine. The small nong is played at that time. Additionally, Bunong people happily gather with their relatives before killing these animals. At that time bamboo tree and tree are cut and carved in the shape of the adults/children. They also drink the wine of jar wine and they blow the small Nong at that time. People also play the Choeng, dance and walk around the buffalo from the evening until early morning. Small Nong can be played for one melody. It is called “rice ceremony”. The big Nong is produced from the upper part of a buffalo’s horn. It is around 20 centimeters long. It can be played/blown anywhere and at anytime. This instrument is used in the ceremony for buying an elephant, catching an elephant and for cutting elephant ivory. Here’s how Bunong people use the big Nong in the ceremony for catching an elephant: a man will blow the big Nong when he is on the way back home, around 100-200 meters from his home, after going to catch an elephant in the forest. This is to inform his family about his return with an elephant. Once his family hears the sound of the big Nong, they rush to prepare and get ready with one bowl of rice, a wax candle and some cakes. Then the man walks the elephant home while he is blowing his big Nong. He will stop when he is around 50 meters from his house and look for a tree to tie the elephant to. Then they will use the one bowl of rice, a wax candle and some cakes to perform the ceremony for the elephant. During this time the big Nong is not used anymore but they will play gongs and Choengs. All the villagers play gongs and Choeng and dance together happily all through the night to welcome the new elephant. The big Nong can’t be used in a normal ceremony such as a wedding or an exhibition. The big Nong can be played for one melody. It is called “catching elephant”. Click here to listen to the music of Nong.